Wesley Study Centre Preaching service, 7/4/2011. The main thrust of the sermon was to drive us towards asking the question of what a life shaped by the Spirit would look like. 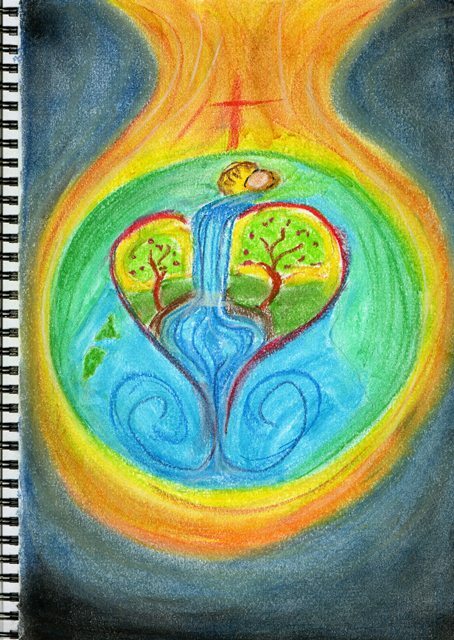 My initial thoughts for the image sprang from Baptist ‘Masterlife’ teaching on ‘The Disciple’s personality’ and began to take shape as a heart into which the life of the Spirit is represented as a waterfall from the ‘resurrection’ symbolised as an empty tomb. There are trees on the banks of the stream symbolic of the fruit of the spirit and one might consider the Ezekiel overtones of the trees whose leaves are for the healing of the nations. The stream continues on its journey out of the heart into the wider world symbolic of a missional outworking of the Holy Spirit centred life.The world is encompassed by the same Spirit and the Cross of Christ is present in the image too for completeness. Japan was in our prayers and I attempted a crude representation of the country to show our concern for the country.